Senate Majority Leader Mitch McConnell of Ky., speaking to members of the media at the Capitol in Washington, Wednesday, Nov. 7, 2018. Senate Majority Leader Mitch McConnell says he expects acting Attorney General Matthew Whitaker to be in place for only a short time, and that President Donald Trump will nominate a different person to replace Jeff Sessions, whom the president forced out this week. Speaking to reporters in his home state of Kentucky, McConnell said he doesn’t question Trump’s authority to replace Sessions at the head of the Justice Department, reiterating that a president can fill his own Cabinet. But the Senate Republican leader gave no hint of support for Whitaker as a permanent replacement. The White House hasn’t ruled that out, despite a barrage of protests from Democrats and other critics who see Whitaker as a Trump loyalist who might obstruct the probe led by Special Counsel Robert Mueller into Russian interference in the 2016 U.S. election. McConnell also reiterated his longstanding support for Mueller’s investigation, despite Trump’s call this week for a speedy end to a probe the president has repeatedly called a “witch hunt” — including on Twitter as recently as Wednesday. Trump installed Whitaker on Wednesday as the nation’s interim top law enforcement officer after ousting Sessions, who’d recused himself from overseeing the Russia investigation. Although Whitaker, 49, has been publicly critical of Mueller and suggested ways to curtail the probe, the interim AG has no plans to step aside from being in charge of Mueller, according to a person familiar with the matter who wasn’t authorized to speak publicly. 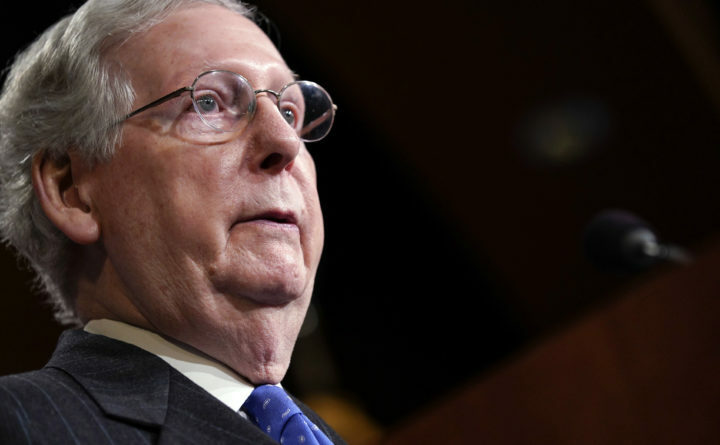 Regarding Tuesday’s midterm election, where Senate Republicans expanded their 51-49 majority, McConnell said he’s already looking ahead to the next vote in 2020. Republicans will be on defense during that cycle, with 22 GOP-held seats up for re-election compared with 12 for Democrats. He said he sees only one pickup opportunity for Senate Republicans — the Alabama seat won by Democrat Doug Jones in a special election in December 2017. Jones scored a stunning win in the deep-red state when he defeated Republican nominee Roy Moore after Moore was accused of inappropriate conduct with teenage girls. “I really do want to win that seat back,” McConnell said, adding that he’ll leave it to Alabama Republican officials to find the best candidate for the party. Sessions is considering running for his old seat, Politico reported this week.